There is no problem at all with this product. There was no problem this time. This review is about item#38444104. Two speaker selectors It's a bit bigger, but it's easy to do soldering Obtaining basic information is useful on hp of Japan Switch. This review is about item#38444515. I replaced the old equipment because I got a bad contact. There is no problem at all in the quality of the product of Nikkei You can get it right away. This review is about item#38444131. 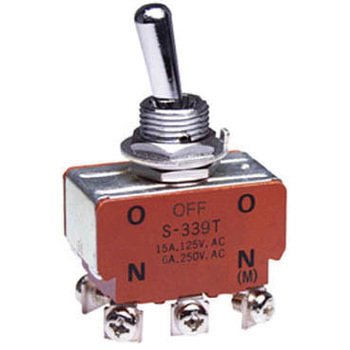 As it is screwed, it can be connected with a crimp terminal without the need for solder, and installation is easy Negative elements should not be waterproof. This review is about item#38444253. It is used for opening / closing the power supply with large capacity of about 7 A, and at the same time it is also using "ON / OFF" dial. I use it several times a day for about a year, but now normal operation. It is cheap because it is bulk good without excess packaging, but it is saved, but since there is no instruction book, one who does not have knowledge should study at some sort of internet site etc. This review is about item#38444156. Although the lever operation feels a bit hard, it seems to be reliable and has a firm feeling. This review is about item#38444174. Although it is not installed yet, it seems that the operation is a bit hard. However, I think that I can use it with confidence because the build is solid. I can not repair if it does not become a holiday, but I think that there is no problem as it is currently in use. This review is about item#38444366. I feel a little hardness in operation, but as expected there is a sense of firmness unlike cheap switch. It seems that durability can also be expected.